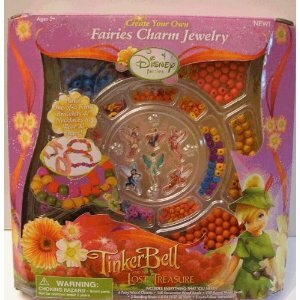 This past Christmas my daughter received a Tinkerbell Charm Bracelet making kit. Upon first glance both Ladybug and I were ecstatic. This set looked like so much fun and was absolutely up my daughter’s alley. Jewelry and Tinkerbell. Until we came down to making them. To start, the beads didn’t have evenly cut holes. That was just about as frustrating as the fact that my fairly dexterous daughter wasn’t able to string a single bead to save her life. No matter what technique we tried, she dropped the string, or the bead. So we compromised. I had her pick out the patterns of the beads and all the charms and I beaded them for her. It was frustrating for her, she really wanted to make the bracelets herself, but she gave up pretty quickly. Once we finished she wore all of the bracelets at once. It was absolutely adorable. She danced around pretending to be high society. And then one bracelet broke. No one was pulling on it. It didn’t get snagged on anything. The elastic simply broke. Not even near the knotted section. I would have called that a fluke until three more bracelets broke within the hour. My guess is that this is just the cheapest elastic that exists, but really you would expect Disney to put a little more effort into this toy. What could have been amazing, turned out to be one disaster after another. Only one bracelet is left, and already one of the charms has gone missing from it. But we have all spent lots of time picking up minuscule beads off the floor. My advice, skip this craft. But if you end up getting it, opt for purchasing your own jewelry grade elastic.